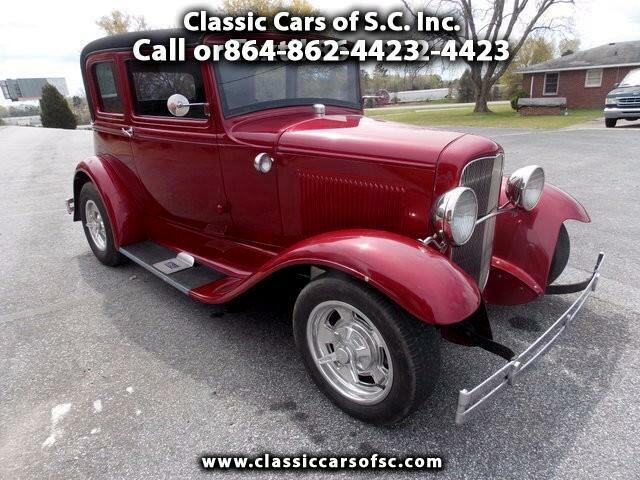 Used 1931 Ford Model A Late 31, leather back Victoria for Sale in Gray Court SC 29645 Classic Cars of S.C. Inc. INVENTORY REDUCTION, PRICE REDUCTION. You are looking at an ALL STEEL, Iconic and Beautiful 1931 Model A Ford Leather back cloth top Victoria...This car was built over 25 years ago and still looks like it was built last year. It has a 1966 Corvette 327 engine with turbo automatic transmission. It has ice-cold Vintage Air, a Wabbits wood dash and a beautifully done Paul Atkins interior. It is setting on a TCI chassis and has genuine Halabrand wheels. The story goes that the former owner / builder purchased the car, a really nice original Model A Victoria, 30 or more years ago in Atlanta, Georgia. He started driving it home to Greenville, SC and it broke down on the way. He had to have it towed the rest of the way home. At that point, he decided to update the vehicle and make it dependable with a modern drive train. A friend of his had purchased a custom TCI chassis that he had not used, so it was purchased and the body was installed on it. A 327 Corvette engine was located and the build began. When the body was finished, the car was sent to Alabama the the legendary, Paul Atkins for the custom leather interior to be installed. I was told that the interior cost close to $12,000 back then and the same interior from Atkins would be around $20,000 today. The owner drove and enjoyed the car for many years until he passed away a few years ago. His widow ended up selling the car to a very good friend of his, and mine. He kept the car for a couple of years and finally let me buy this beauty. I had to redo all the rubber suspension bushings and update the power brake booster. I did not like a couple of things he had done to the car. He had removed the beautiful original scrolled exterior door handles and installed the remote door poppers. I did not like that at all so I reinstalled the original door handles. He had also replaced the Iconic Model A hood with a Rutlib, 3 piece hood with flat side panels instead of the original louver look. I just did not like that at all either, so I ordered a set of Rutlib louvered side panels to give the car a more original look. Now the are was to my liking. I have enjoyed it for a couple of years now and now it is time for you to enjoy this Iconic beauty. You will look a long time before you find a nicer one!! More pictures to follow...We have just reduced the price of this Beauty from $37,500.00 down to $35,000 which I feel is very fair for a car like this one with the potential that this vehicle has. I might consider a possible trade, what do you have? What are you looking for? Let's talk!!! I sure would love to make this Classic yours. What can I do to make that happen? If this Classic is the vehicle of your dreams then the best time to buy it is BEFORE someone else does. NOW is the time. The customer who may have looked at it yesterday and said I will buy it tomorrow may come back today and buy it while you are waiting to buy it tomorrow. Do not wait another minute. Give me a call right NOW so we can make this beauty yours. RIGHT NOW. You will be GLAD that you did!!! We specialize in Father and son restoration projects. We are located in the northwestern part of South Carolina 20 minutes south-east of Greenville. Drop by anytime and take a stroll through our Field of Dreams. You may just find that car of your dreams. I hope to see you soon. Give me a call on my toll-free number at 1-866-942-7716 so we can talk person to person about this car. If you happen to be out of our toll-free calling area call us on our regular number at 1-864-862-4423. We ship all over the world at your expense. We always have dozens and dozens of collector cars available for sale at all times. Visit Classic Cars of S.C. Inc. online at www.classiccarssouthcarolina.com to see more pictures of this vehicle or call us at 864-862-4423 today to schedule a look at this classic. We have shipped to just about every state in the US and 34 foreign countries. If you like you may text me at 1-864-313-2908.